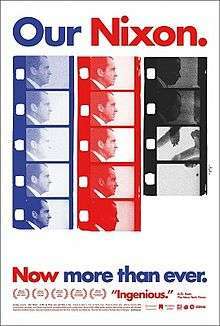 Our Nixon is an all-archival documentary providing a view of the Nixon presidency through the use of home movies filmed by top Nixon aides combined with other historical material. It was directed by Penny Lane. Throughout the Richard Nixon presidency (1969–1974) three of his top White House aides—chief of staff H.R. Haldeman, domestic affairs adviser John Ehrlichman and special assistant Dwight Chapin—extensively documented their experiences with Super 8 home movie cameras, creating a visual record of over 500 reels. These films were seized by the FBI during the Watergate investigation, then filed away for almost 40 years. Our Nixon is an all-archival documentary presenting these home movies together with other material, including excerpts from the secretly recorded Nixon White House tapes, contemporary news reports, and later interviews with the three staffers. Our Nixon made its North American debut at 2013 South by Southwest and its international debut at the 42nd International Film Festival Rotterdam. The film has subsequently screened at notable film festivals, including, among others, AFI DOCS in Washington, DC, the Los Angeles Film Festival, the 39th Annual Seattle International Film Festival, where Our Nixon won the 2013 Grand Jury award for Best Documentary Film, the 51st Ann Arbor Film Festival, where it won the Ken Burns Award for Best of the Festival, the 11th Annual Independent Film Festival of Boston, where it won the Karen Schmeer Award for Excellence in Documentary Editing, the 19th Annual Nantucket Film Festival, where it won the Adrienne Shelly Award for Excellence in Filmmaking, and the 9th Annual Traverse City Film Festival, where it won the Founders Prize for Best Documentary. Our Nixon was also chosen as the closing night film for the Film Society of Lincoln Center and Museum of Modern Art New Directors/New Films Festival in New York City. Our Nixon made its United States television premiere on CNN on August 1, 2013, and was released theatrically by Cinedigm on August 30, 2013. ↑ "'Our Nixon' Director Penny Lane on Kickstarter's Early Days and Doc Trends She Hates | Tribeca". Retrieved 2016-08-28. ↑ Harris, Brandon, In Rotterdam, a Strong Crop of American Indies Filmmaker Magazine (Jan. 30, 2013). ↑ "Our Nixon". L. A. Film Fest. Retrieved January 19, 2014. ↑ "Festival Award Winnders". SIFF. Retrieved January 19, 2014. ↑ McKee, Jenn (March 25, 2013). "Ann Arbor Film Festival announces 2013 award winners". The Ann Arbor News. Retrieved January 19, 2014. ↑ Mark, Bell (May 1, 2013). "2013 INDEPENDENT FILM FESTIVAL BOSTON ANNOUNCES AWARD WINNERS". Film Threat. Retrieved January 19, 2014. ↑ "Awards". Nantucket Film Festival. Retrieved January 19, 2014. ↑ "Traverse City Film Festival 2013 Awards!". Traverse City Film Festival. August 4, 2013. Retrieved January 19, 2014. ↑ Discover: Penny Lane Connects the Dots Into a Tender “Our Nixon” Brian Brooks, Film Society of Lincoln Center Blog (Mar 27, 2013). ↑ Nixon documentary focuses on the other secret White House tapes: Home movies Holly Bailly, Yahoo! News (Mar. 27, 2013). ↑ Exclusive: Our Nixon Trailer TIME Entertainment (Jul. 15, 2013). Exclusive: Our Nixon Trailer TIME Entertainment (Jul. 15, 2013).